Appearance: Like most of her kind, Illianna possesses smooth dolphin-like flesh. However, her’s is a soft grey with a slight blue hue with a smattering of spots all long her shoulders, back, face, and tentacle-like head fins and only a tad larger than human freckles in most places. She is short, standing at only about 5’2” in height but slender and athletically built from a lifetime of swimming. Her attire typically consists of lightweight and sheer materials that she wears around her waist like a sarong. 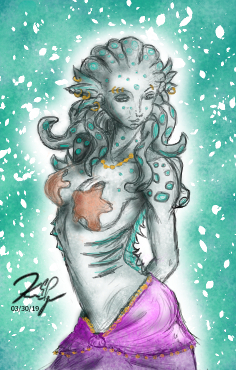 On her breasts, she is fond of shiny ornaments and carefully crafted coral and sometimes the occasional ‘decorated’ starfish. Not that she cares much for modesty, she just likes the way it looks. Naturally curious and filled with wanderlust, it is difficult for Illianna for stay in one place too long least she grow bored. Sometimes her curiosity and blatant desire for knowledge tends to get her in trouble. 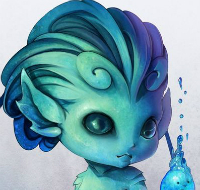 Ever since she was a child, she was forever swimming off to explore and hunt for treasures. Though that did not mean she lacked in her basic education. She enjoyed learning and loved the stories the elders told. By the time her teachers deemed her knowledgeable enough to make her own way, she was gone in a flash to see the world and places she had learned about. Heirloom: A pretty, shiny stone that is fashioned into a necklace. She got it from her mother.